It was just about 45 years ago that I met Bernie Rink. I had recently graduated from college, and was trying to figure out what I wanted to do with my life. Bernie was the librarian at NMC, growing grapes on his small sand hill farm on the east side of Lake Leelanau in Leelanau County and making wine in his basement. With his wife, Suzanne, they were raising five boys. 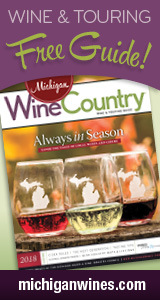 L. Mawby owner/winemaker Larry Mawby reflects on lessons learned from Boskydel owner/winemaker Bernie Rink, a pioneer of grape-growing and winemaking in Northern Michigan.